Today saw the completion of a major refit of the Molossia Railroad, and the inaugural run of our newest engine, "Mustang". Since its inception in 2000 XXIII, the Molossia Railroad has used an old-fashioned "Hook and Loop" couplers to join its cars and locomotives. This has proved problematic, especially as regards our Porter Tank locomotives. They simply wouldn't adapt to the hook and loop couplers, which essentially sidelined our workhorse engine, "Rattler". Thus it was decided to replace all of the hook and loop couplers with the more conventional and modern "knuckle" couplers. This conversion is about 60% complete, but has already has a positive result, finally bringing "Rattler" back onto the tracks after several years of enforced retirement. The conversion to the new couplers should be complete by the end of January. 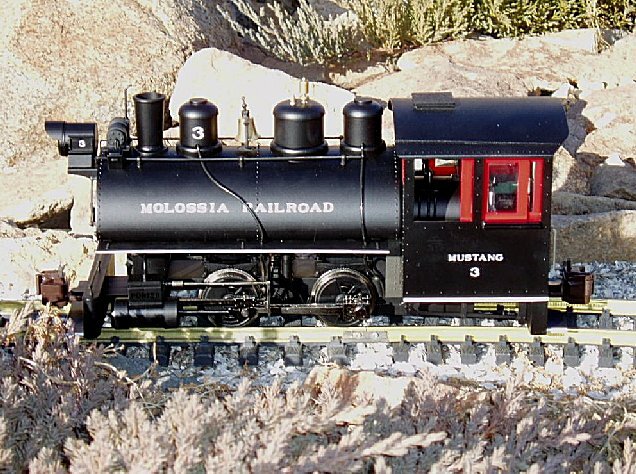 In addition to this refit, the Molossia Railroad is proud to announce the arrival of a new engine. Dubbed "Mustang", it is our second Porter 0-4-0 saddle tank engine, built in 1908. Purchased new, Mustang is a oil burner, and is intended for general use use on the Molossia Railroad. The H. K. Porter Company was one of the best known locomotive manufacturers. It was the third largest producer, in terms of number of locomotives built, and was the leading producer of what Porter called 'Light Locomotives'. These were engines built specifically for industrial applications, mining, logging, plantations, or lightly built narrow gauge railroads. They helped to build the West, and are found in every country from Argentina to Zanzibar. Mustang is the latest addition to the proud Molossian locomotive fleet. The website for the Molossia Railroad can be visited here.